Published Bestsellers: Neal James' interview with Victoria Watson, Elementary Watson Blog. Neal James' interview with Victoria Watson, Elementary Watson Blog. Q1) What do you like most about writing? What do you dislike (if anything)? The freedom that it gives to my imagination. 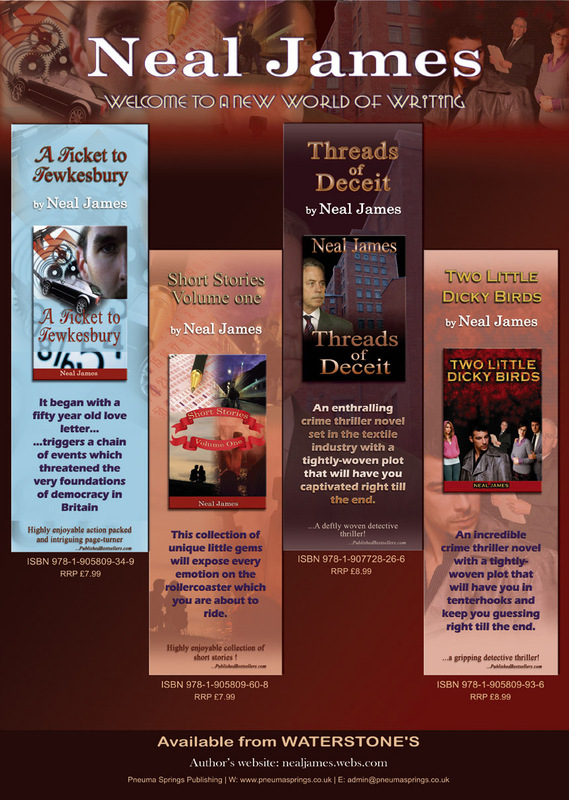 As Neal James, I can step into another personality and write the kinds of things that Philip Neale, the accountant, could never even contemplate. Q2) What inspires you to write? The challenge of doing something completely outside of my normal routine. It’s like being on holiday without ever leaving the comfort of your familiar surroundings. Q3) Do you find time to read, if so what are you reading at the moment? Reading is another one of the major sources of inspiration. Just seeing what other writers are doing is a massive pointer as to where I could be. I never copy what I write, but the ideas which come out of reading, say, another crime novel always set me thinking. I’m reading ‘A Place of Execution’ by Val McDermid; it’s a crime novel set in Derbyshire where I live. Q4) Which author(s) has/have had the biggest influence on your writing? Crime – James Patterson, Jeffrey Deaver, Val McDermid. Science Fiction – Isaac Asimov, Frank Herbert. Humour – Jasper Fforde, Deric Longden. Horror – James Herbert, Stephen King, Dean R. Koontz. Q5) If you weren’t a writer, what would you be doing? I am actually a CIMA qualified accountant, and have been doing the job for over 30 years. It puts bread on the table and gives me the flexibility to indulge in writing as a passion, and not something on which I need to rely for an income. Q6) What do you think are your strengths and weaknesses? Strengths? Writing in a variety of genres; I never seem to get ‘Writer’s Block’. Each style has its own stories to tell, and that’s the beauty of it – I never chase down a story; I let them tell themselves to me as and when they are ready. Time is another factor – my publisher never pressurises me and this gives me a relaxed atmosphere in which to get things down on paper.